After years of sheltering Hungary’s illiberal prime minister Viktor Orbán and his ruling Fidesz party, the EU’s most powerful political family has suspended the controversial Hungarian party. The European center-right took on a troublemaker in its own ranks on Wednesday when the European People’s Party (EPP) indefinitely suspended Hungarian prime minister Viktor Orbán’s populist Fidesz party. Fidesz will lose its voting rights within the EPP and its ability to put forward candidates for party positions. In an effort to show that the EU’s largest political family can rein in its own extremes, Orbán’s party was put on notice—and expulsion after the European elections in May remains an option. But by not kicking out Orbán’s party, the EPP avoided, for now, giving a boost to the populist and anti-migration forces in Europe that are expected to do well at the ballot boxes. And Orbán has been able to spin to the ruling to show that he is still in control, calling the compromise a “good decision” and noting that the motion says Fidesz and the EPP “jointly” agreed on it. In a heated three-hour debate among the around 260 national party delegates in Brussels on Wednesday, even Orbán’s closest allies within EPP supported a compromise decision to suspend Fidesz indefinitely. EPP members had gradually grown frustrated with Orbán, who has eroded democratic freedoms and the rule of law back home while criticizing EPP leaders for being weak and supporting migration. In his latest stunt, which propelled the EPP into action, Orbán oversaw a campaign against EU commission president Jean-Claude Juncker, a fellow EPP member and Orbán critic. In recent weeks, thirteen national parties have called for Fidesz to be expelled from the EPP. A Punishment or a Reprieve? But the EPP allowed Orbán to turn the suspension into a victory march. The wording of the document adopted by 190 members of the EPP’s political assembly lets Fidesz argue to his voters that, in fact, it decided to suspend itself. 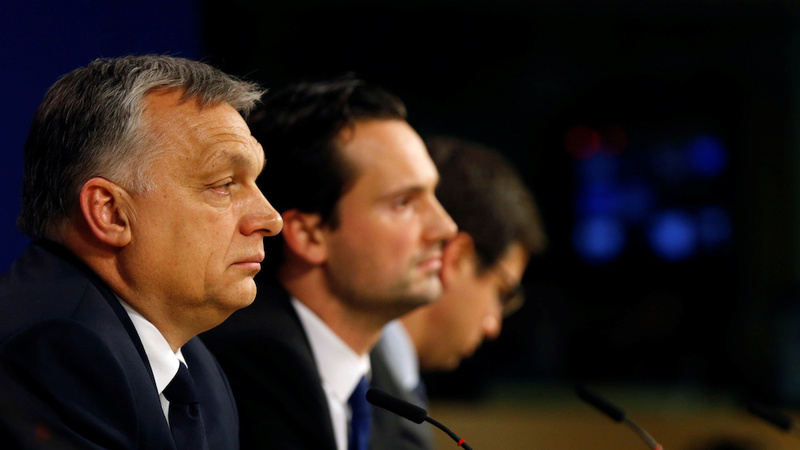 “We cannot be expelled, and we cannot be suspended,” Orbán told reporters after the meeting. Earlier in the day, Orbán had threatened to pull his party from EPP if it was suspended unilaterally, giving him leverage in negotiating his own punishment. Back in Hungary, the network of pro-government media promoted Orbán’s interpretations of events as a victory. “No expulsion, no suspension,” was the headline of the news website Origo. “The pro-migration action has failed, they could not push Fidesz out,” was the title of another story. The public broadcaster has called EPP’s punishment a “huge victory”. Orbán announced at his press conference that he is also setting up a three-member group with MEP Jozsef Szajer, EU State Minister Judit Vajda, and Katalin Novak, the state secretary for family issues, to report back after the elections on the issue of whether Fidesz should remain in the EPP. The team would be negotiating with the Van Rompuy group, Orbán said, although the EPP’s internal document on the decision mentions no need for negotiations. In Orbán’s world, it is Fidesz that decided to suspend its membership to assess whether EPP is true to its Christian democratic values. Orbán even told reporters: “We never had any campaign against Juncker,” giving an insight into the absurdity of the Hungarian government’s propaganda. “Thirteen parties wanted to push the right wing of the party out,” Orbán said at the presser, arguing that it was thanks to his negotiations and willingness to compromise that party unity was preserved. “I hope we can lead a united campaign, and liberal ideas will not dominate the party, but it will be a balanced party family with Christian conservatives inside it,” he added. Weber, who hails from the Bavarian Christian Social Union (CSU) party, was keen to put the “Orbán problem” behind him as his campaign picks up for the EU commission presidency. The EPP camp is now trying to shift the harsh spotlight onto its rivals, arguing that the Socialists need to rein in their Romanian member party, the ruling Social Democrats, who have curbed judicial independence in Bucharest, and that the Liberals need to scrutinize their Czech member which has been dogged by corruption. How did Orbán escape expulsion? He had threatened last year that he could easily set up an anti-migration political alliance outside of the EPP with like-minded parties, and his EPP colleagues took notice. There was real concern in the EPP that expelling Fidesz now could not only send the wrong message about party unity in the middle of the European campaign, but could also give a boost to populist, anti-migration parties in the run up to the vote. Orbán has openly hinted at setting up a new party with Poland’s ruling Law and Justice party (PiS), which is also shunned by the EU for putting the judiciary under political control. Italy’s interior minister Matteo Salvini, whose anti-migration League party is expected to be the second biggest national party in the next European Parliament, has also reached out to PiS and praised Orbán. The compromise allows both Orbán and the EPP to await the final results of the European elections and rethink their strategy. Fidesz MEPs will continue to be allowed to sit with the EPP in the European Parliament for the few remaining sessions in this term. As the EPP is expected to lose dozens of MEPs in the next elections, Fidesz MEPs could provide useful support in the future for Weber’s quest to find a majority that supports his bid for the commission presidency. By sidelining Orbán, Weber also aims convince the other EU leaders—whose backing he needs for the commission top job—that he can rein in the populists. Indeed, Weber wanted to demonstrate to his potential allies that Orbán will not push the EPP to the right, and Hungary’s self-described “illiberal” leader cannot set the agenda for the entire party. “Fidesz will have no say any more on the EPP’s political approach,” Weber told reporters after the meeting. However, critics—even within his own party—say Weber is not tough enough and the suspension only kicks the issue of dealing with Orbán further down the road. “Shameless move by Manfred Weber: a suspension just in time for the European elections, after nine years of attacks on rule of law by Orbán, and an evaluation in the fall, just before knowing if he needs Orbán’s votes to get the European Commission presidency,” former Green MEP Rui Tavares said in reaction to EPP’s rebuke. Tavares’s 2013 report in the European Parliament already warned about Orbán’s rolling back of democratic freedoms. Despite Weber’s efforts, the questions persist: who is in charge of the EPP, and is the tail wagging the dog?